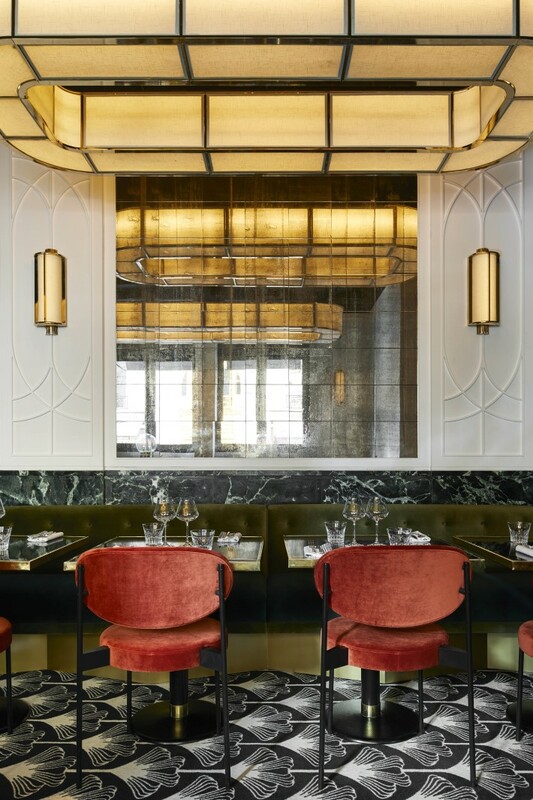 In 2008, top interior designers Emil Humbert and Christophe Poyet were approached by renowned restaurateur Riccardo Giraudi to design the interior of his Beefbar concept restaurant in Monaco. 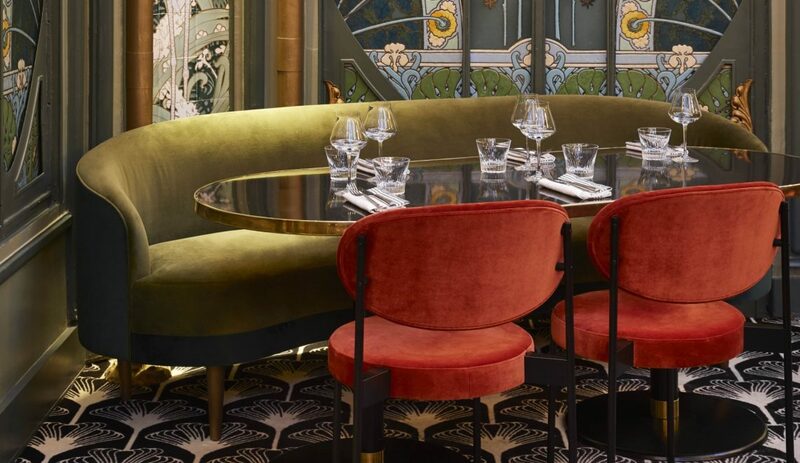 A decade later, it is Humbert & Poyet’s fourth partnership with Giraudi in designing his seventh, and arguably most extravagant Beefbar restaurant in Paris. Interior architect and design agency Humbert & Poyet, founded in 2005, has quickly become known in the interior design industry for their timeless, elegant, and luxurious designs. 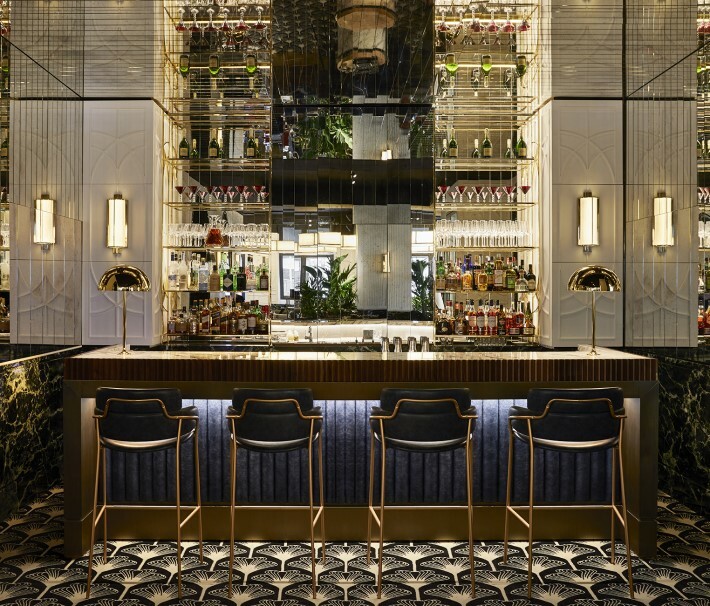 Their portfolio spans a wide variety of restaurants, stores, hotels, among other interiors. 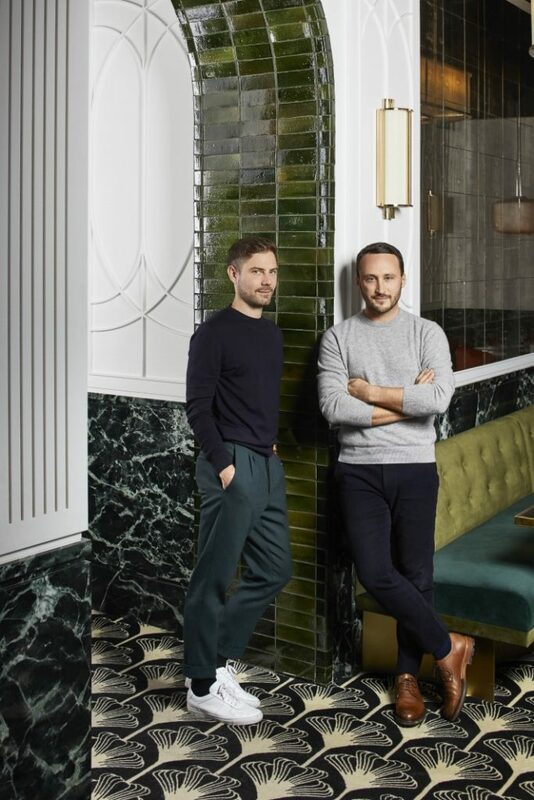 Through their projects designing luxury for everyday living, they have developed a common design ethos by seeking to evoke emotional states. 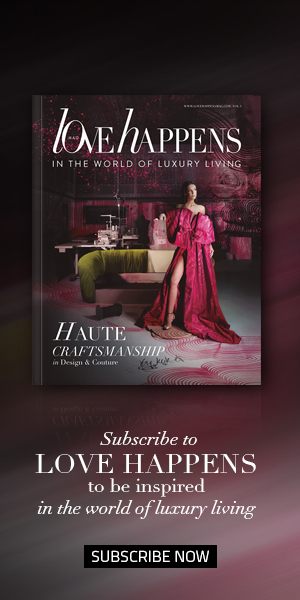 Sophisticated and enduring, Humbert & Poyet creates masterpieces through attention and care for fashion, architecture, and interiors. Beefbar Paris opened its doors to the public in November 2018 – in walking distance from the Champs-Elysees and within view of the Eiffel Tower, the fourth Beefbar location is perhaps its most ambitious one to date, and the interior does not disappoint. 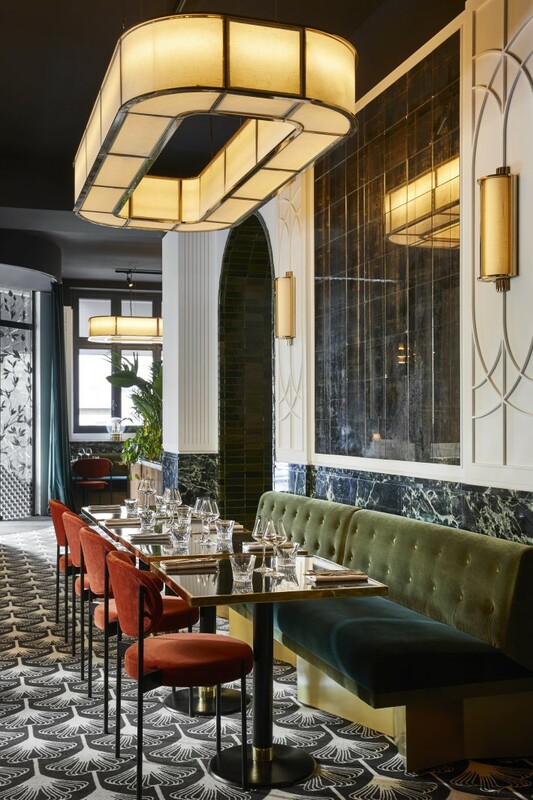 A beautiful restoration of the old Lamgham Hotel atrium, the Beefbar dining room evokes emotions of splendor with its harmonious designs incorporating Art Nouveau, Art Deco, and even Modern Industrial elements. Even more interesting is the Lamgham Hotel atrium’s history. Originally designed in 1898 by architect Emil Hutre and painted by Jules Wielhorski, it was walled in and hidden during World War II to protect the space from Nazis. The rediscovered room, complete with its intricate glass ceiling, became a historical monument, despite being damaged. 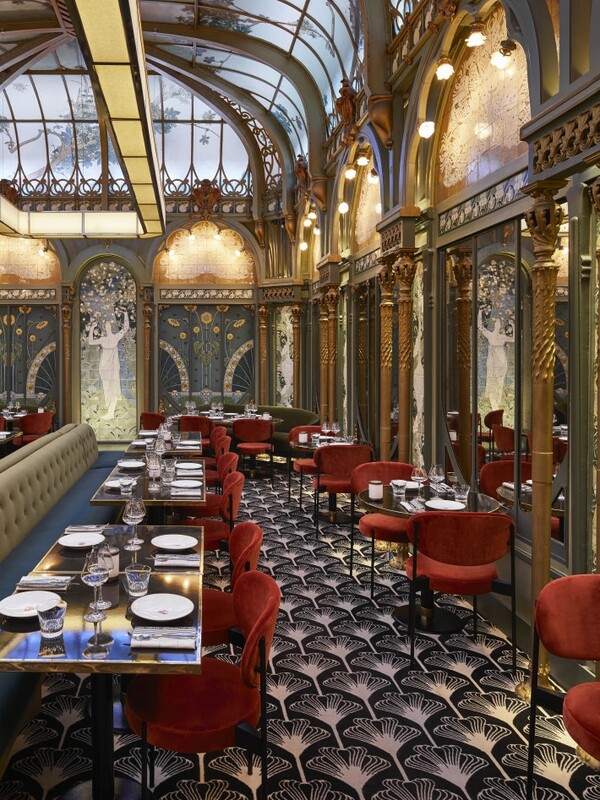 Humbert & Poyet stepped in to rewrite a piece of the space’s history: the best artisans were called to execute the restoration, resulting in a truly grand and impressive space that carries with it a patina of a world since long gone. 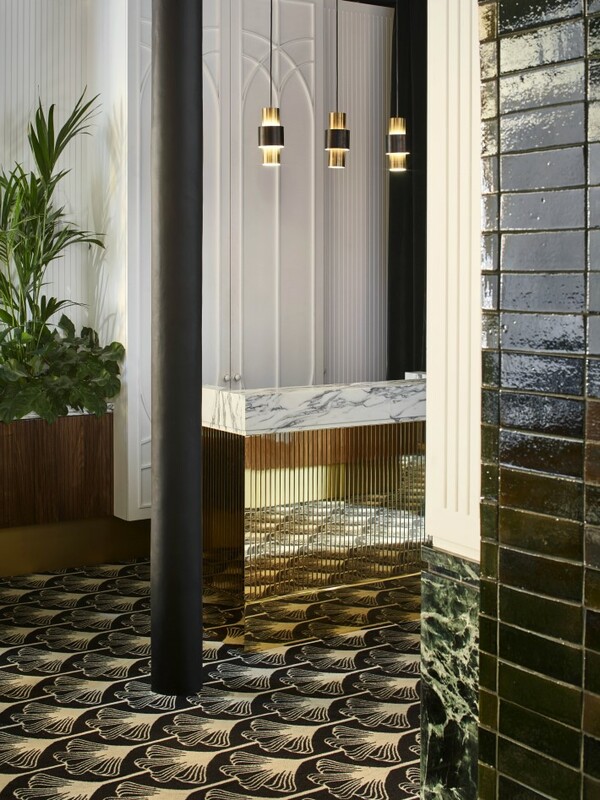 With rich green and bronze tones, patterned carpets, cut mirrors, marble detailing, and industrial elements, Humbert & Poyet have breathed new life into the Old Lamgham atrium, what they call a “love game between sobriety and eccentricity.” With a heavily acclaimed dining experience curated by Beefbar’s global executive chef Thierry Paludetto and Beefbar Paris’ chef Abriele Faiella to match, Beefbar has already solidified its standing as one of the best restaurants in Paris. 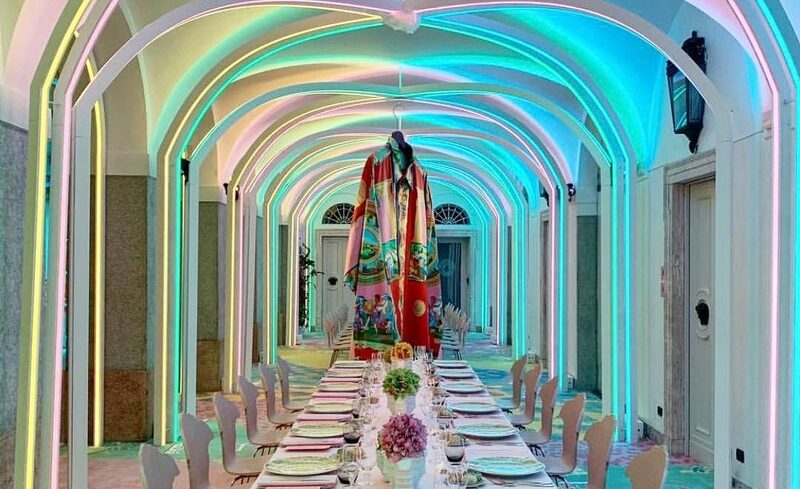 Following the completion of the Paris location with all its splendor, next to come is Riyadh, Rome, Tulum, and Luxembourg. Humbert & Poyet have set themselves a high bar with Beefbar Paris, but we are excited to see this partnership continue and the new spaces they will be creating around the world.